In the recent news, the well-known Chinese smartphone manufacturer known as Huawei has surpassed Apple with its sales figures of new mobile phone range. Huawei has also now become the second biggest mobile phone manufacturer in the world with its sales of new Huawei phones range. According to IDC reports, it is seen that the overall mobile phone market has shrunk by 1.8 percent in the second quarter of year 2018. 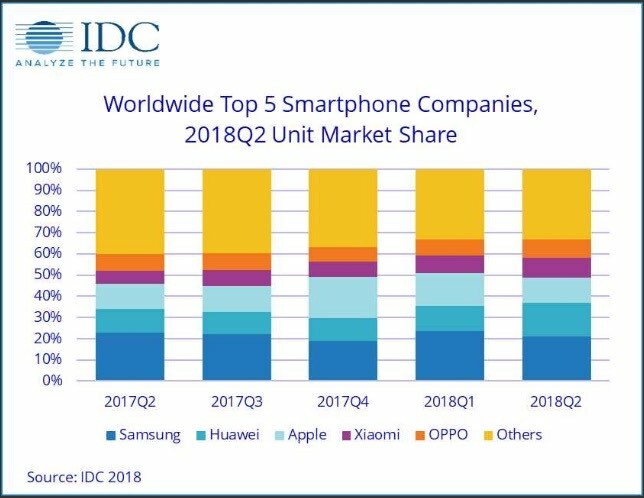 Though, the biggest surprise is that Huawei Company now owns a 15.8 percent market share with shipping 54.2 million new Huawei phones in Q2 of 2018. However, it surely doesn’t mean that Apple is performing poorly in selling its iPhone mobiles. The company is shipping more Apple iPhones this year as compared to its sales last year. In the mobile phone industry, Apple is also the biggest shareholder with 12.1 percent in the market. Samsung on the other hand is shipping 10.4 percent less mobile phones as compared to last year but still is the market leader with 20.9 shareholder in the mobile phone market or in other words sold 71.5 million mobile phones. Though, there are many Samsung buyers who are now buying Huawei latest mobiles and other Android operating system mobiles. If we talk about the positions in top mobile phone sellers than it goes like this Samsung, Huawei and then there is Apple. Though, from some reports it is found that Apple is not only suffering from less sales but also from seasonality as compared to its rivals in the mobile phone industry. Huawei and Samsung sells and release many new mobile phones all year long. On the other hand, Apple usually releases its new mobiles mostly in September every year, which helps it to create a huge spike in the last quarter of the year. The latest Huawei phones include phones like Huawei P20 lite, P20 Pro, Mate 10 Pro, Y7 Prime and many more. Huawei Mate series is quite popular across the globe as compared to Huawei Honor series. The main reason behind the popularity of new Huawei mobiles is their price. The new Huawei mobiles price is quite competitive as compared to Apple iPhone mobiles available in the mobile phone industry. Apple iPhone mobile range shows popular iPhone models which include iPhone 5s, iPhone 6, iPhone 7, iPhone 8 and iPhone X. The consumers who wishes to buy a new Apple iPhone can certainly buy it from any authorized Apple store across the globe. However, it is expected that Apple might cross Huawei as well as Samsung in a couple of quarters by introducing new iPhones for its valued consumers across the globe. It is really interesting to see that Huawei is performing well while it recently had quite some issues with the US government. If you are a US resident, then browse smartphone category on Amazon and you will see the Huawei Honor mobiles usually appears on the top of the list. The Honor series by Huawei is its midrange mobile phone range. 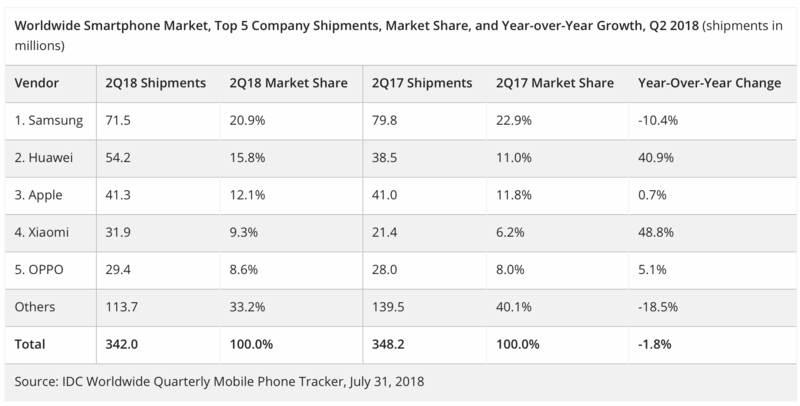 We all are likely to see a shift in these top mobile phone vendors rankings over the course of next few quarters as it is also one of the weakest quarter of the year for Apple. At the current stage, Apple’ flagship iPhones are several months old, which is the reason behind their speed slowing in sales across the globe. After the launch of new Apple iPhones in the fall, we are expected to see a much stronger shipment numbers during the fourth quarter of 2018 and most probably the first quarter of 2019. In the last few years, Apple is dropped to the 3rd position for the first time but most probably it certainly will not stay there forever. Apple has shipped 41.3 million Apple iPhones which is a modest growth of 0.7% as compared to the last year selling of 41 million units sold last year. Apple has continued to perform well at its high end mobile recently launched called iPhone X, which also remains the top seller in many mobile phone markets across the globe. Apple is expected to regain its first position by the well expected launch of its three next generation Apple iPhone models this fall. The new iPhone mobiles are rumored to be featuring different screen sizes, enhanced performance, new features, competitive price and many more when they will arrive in the next quarter of 2018. According to some rumors in the mobile phone industry, Apple is planning to compete in the mobile phone industry by introducing some mid-priced iPhones in the last quarter of 2018 and first quarter of 2019. There are expectations that a low priced 6.1-inch iPhone with extravagant features including Face ID, edge to edge display and same fast processor as seen in the company’s expensive OLED iPhone models. In the past few months, we also have heard the news regarding Huawei the Chinese mobile phone manufacturer giant has claimed that they have considered the idea of introducing notches before its rival launching Apple iPhone X. The recently launched Huawei’s P20 series is featuring notch design mobiles. The mobile chief of Huawei Li Changzhu has revealed at the Huawei Analyst Summit that for the past many years company has been debating a lot about the controversies regarding notches. According to one of the Huawei mobile company representative it is found that the company was the first in line to have a look in expanding the display area of their entire mobile phone range. The company have been planning on this for a duration of two to four years. Huawei decided to use innovative notch design in their mobile phones but decided to postpone it for some time. Mobile Chief of Huawei said that the company was following a conservative and cautious approach to establish the brand name in the mobile phone industry for which they just decided to introduce the traditional 16:9 aspect ratio for the current time. He also said that the company making mistakes like this will surely be not made in future as it is now entering the new era of advancements in 2018. The company has taken the first step in the new technology era by introducing a new color by the name of “Twilight” for their current flagship mobile phone Huawei P20 Pro. Moreover, the addition of three rear cameras in this Huawei mobile is also the first innovation by any known mobile manufacturing company. Huawei applauses the decision of Apple to make the display notch their mainstream design for their entire Apple iPhone mobile phone range. Below I am doing a detailed comparison of both these companies’ flagship mobile phones called iPhone X and Huawei P20 Pro. Having a first glance at the new flagship mobile phone by Huawei “P20 Pro” it shows that it features a similar design language like its rival flagship mobile phone known as “iPhone X”. But the question here is that will it be able to give a tough competition to the Apple’s flagship model? Or which is the better match for you? Let’s start by doing a detailed comparison of both these flagship mobile phones. 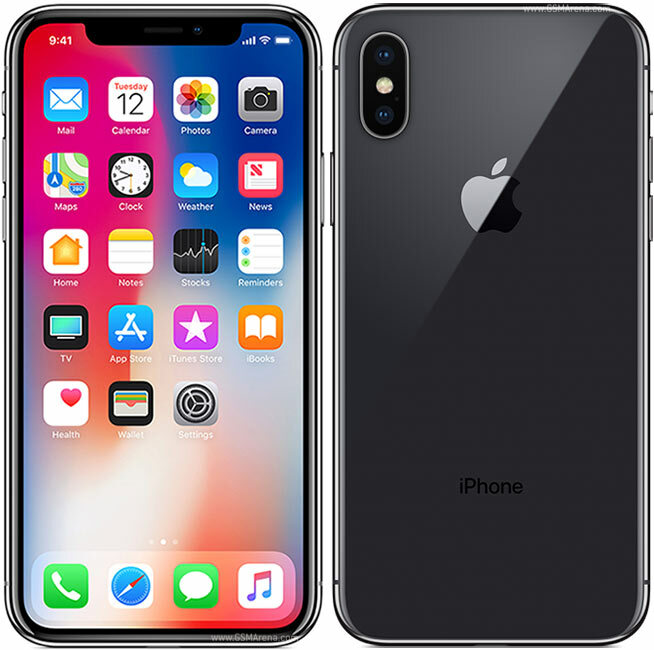 The new flagship mobile phone by Apple iPhone X it has an entire different look and feel as compared to company’s previous iPhone range. It comes with thin edges, no physical home button, a glass screen and an updated software system. Now the users have the opportunity to unlock the mobile phone by using a personal Face ID instead of using the traditional fingerprint scanner. Though, this security feature is the most secure of them all. Even though the screen size of this current flagship mobile phone is bigger as compared to the previous models by it required les power. Moreover, this is also the first ever waterproof Apple iPhone. Is iPhone X the best choice for you? Yes, without any doubt if you are looking to buy a state of the art mobile phone with a massive display and appealing camera. Unsurprisingly, both these great features comes at a corresponding price as the iPhone X price in Pakistan is Rs.139,200. This is the reason why you must need to keep your iPhone X well protected at all times. There is a vast variety of safety cases available for this flagship mobile phone, which can help you protect it from damage in case of accidental falling on the ground. Huawei P20 Pro features a quite similar design language like the Apple’s iPhone X. Though, there are quite some differences between both these flagship mobile phones. First of all, both these flagship mobile phones features a glass back but P20 Pro is available in more exotic and appealing colors as compared to its rival Apple iPhone X. Especially, the newly launched color “Twilight” which is both purple and green at the same time. Even though, this current flagship mobile phone by Huawei has a notch at the top. Moreover, it still has a home button and fingerprint scanner below the screen on the front. The rear cameras are arranged vertically at the back of the mobile phone. The three cameras at the rear meets a total up to 68MP, whereas at the front you get to see a 24MP front selfie shooter. Just like its rival, it is also IP68 certified water proof and has no headphone jack. Is Huawei P20 Pro the best choice for you? The answer to this simple question is yes without any doubt, as if you have a passion for photography this new flagship Huawei mobile phone is the best option for you. Its camera setup is the most impressive feature, which makes all the difference. The pictures taken by this mobile phone will certainly turn great without having the issue of buying an expensive camera equipment. On some points, Apple’s iPhone X is quite ahead of its rival P20 Pro. One of them is surely its original design which gives a more premium look and also the screen quality is better. Though, Huawei’s P20 Pro gets close in most aspects like the camera setup and much bigger battery. Price is considered as one of the most important factor for most consumers while buying a new mobile phone. In terms of price, Apple’s iPhone X price is quite high as compared to the Huawei P20 Pro price in Pakistan. Even though the design of both these flagship mobile phones is quite similar with a few differences such as the fingerprint scanner placing of Huawei P20 Pro and its availability in more appealing colors as compared to iPhone X. Moreover, the camera setup is also similar in both these flagship mobile phones. P20 Pro is a bit large and wide as compared to iPhone X, but both are similarly thin from sides. Having a big size makes Huawei’s flagship phone slightly heavy. Having similar design language but the features of both the flagship mobiles is different. Both the phones have powerful and high performance processor. P20 Pro comes with 128GB of internal storage which is fairly much more than the standard internal storage of the iPhone X. Another difference which is mentioned before is the new Face ID of iPhone X as compared to the Huawei’s fingerprint scanner. Moreover, iPhone X has a smaller battery as compared to the P20 Pro of Huawei which is 4000mAH and iPhone has 2716mAH. Huawei flagship mobile phone doesn’t have wireless charging till date. Apple’s iPhone X has a great camera set up by having a dual rear cameras of 12MP, but the Huawei’s P20 Pro has a triple camera setup having a total of 68MP of rear camera, which is quite impressive. The results of Huawei cameras is also much better as compared to the Apple’s flagship phone. Well, at the end I will end this blog by saying that it is all up to you to choose which mobile phone you need to buy as all depend upon your financial budget. Do let us know in the comments section below about which mobile phone you will choose.